(1) We are looking for a second author to write the Case of the Week discussions, so we can get ahead by several weeks, and are covered when one author goes on leave or has a busy period. You must be a staff pathologist and a good writer. The advantages are getting known by the 6500+ subscribers to this feature, as well as $75 per case discussion. The initial time commitment is 2-3 hours per week. When we are caught up, it will be less. If interested, contact Dr. Pernick at NatPernick@gmail.com, and attach your CV and a writing sample. (2) Recently, we posted a link to a new article on our Management page: "A Quick Look At The 2017 Proposed Medicare Fee Schedule", by Mick Raich, Vachette Pathology. New Product Announcements from BoardVitals and BioSB are now available for viewing and three (3) new Product Questionnaires have been posted under Antibodies / Biomarkers (BioMosaics and Agilent Technologies, Dako) and Laboratories (Machaon Diagnostics). 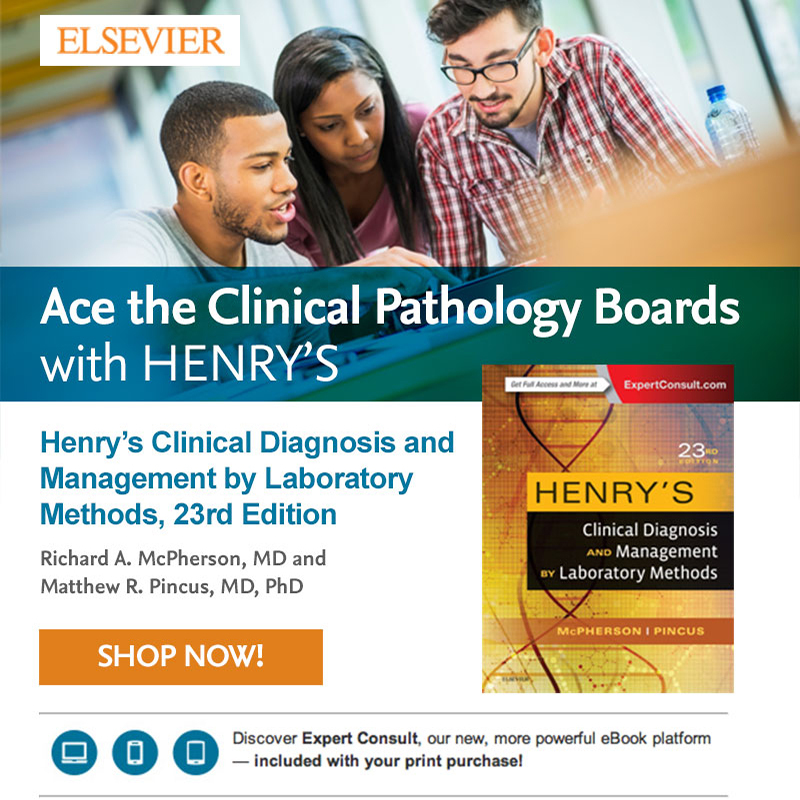 (3) We offer companies and laboratories a great opportunity to reach Pathologists quickly and relatively inexpensively, by advertising in our various email newsletters. These newsletters are received only by those who sign up for them, either online or at conferences. This means the content, including your advertisement, is more likely to be read thoroughly. We currently have 5 emailed newsletters: Case of Week; Commercial / Promotions; Jobs, Fellowships, Conferences email; Website news email; What's New in Pathology email (new). Contact us at pathoutads@gmail.com or 248/646-0325 for more details. 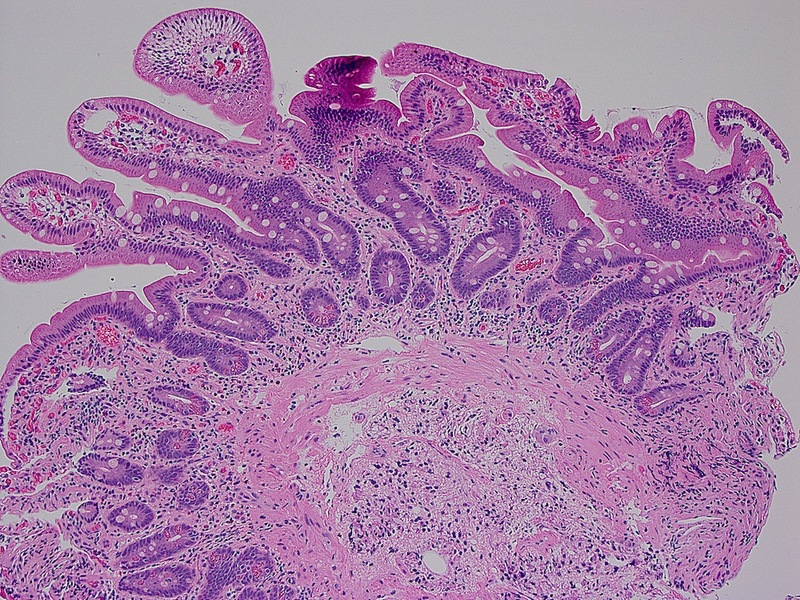 A 73 year old man with non-specific abdominal pain underwent duodenal endoscopy with biopsy. He had a prior history of GE junction adenocarcinoma, received neoadjuvant chemotherapy and had no residual disease at resection. 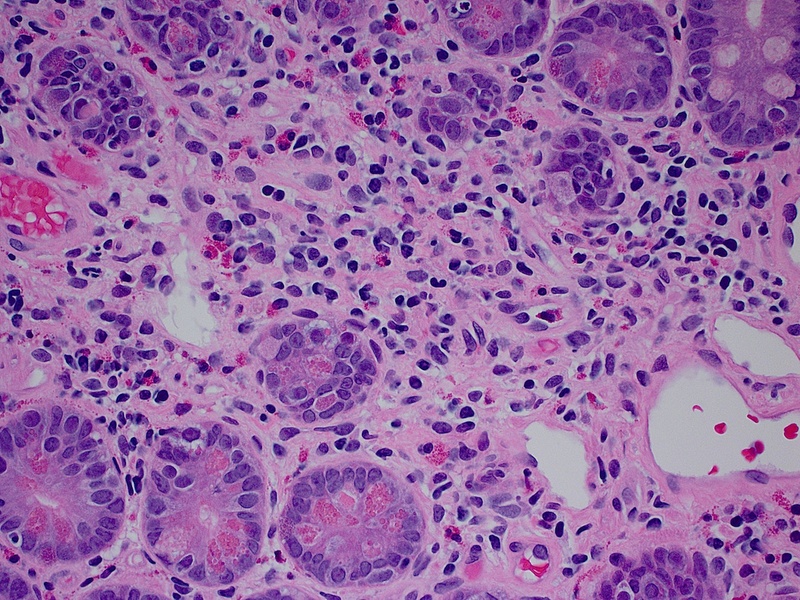 He also had prior abdominal marginal zone lymphoma (stage and treatment unspecified). On low power, some villous blunting is appreciable, but the most noticeable feature of this biopsy is the hypocellular lamina propria. On higher power, the lamina propria completely lacks plasma cells, which is seen in about two-thirds of patients with common variable immune deficiency (CVID, Am J Surg Pathol 2007;31:1800). CVID results from a dysfunction of B cell differentiation, which causes hypogammaglobulinemia, reduced antibody response to vaccines and infections, and increased risk of infections. It can be diagnosed in childhood, or may present later in life. The disease is heterogeneous with different genetic mutations. Most cases are sporadic, but ~20% are familial (Am J Surg Pathol 2007;31:1800). Up to 40% of patients with CVID have GI symptoms including diarrhea, malabsorption and weight loss. 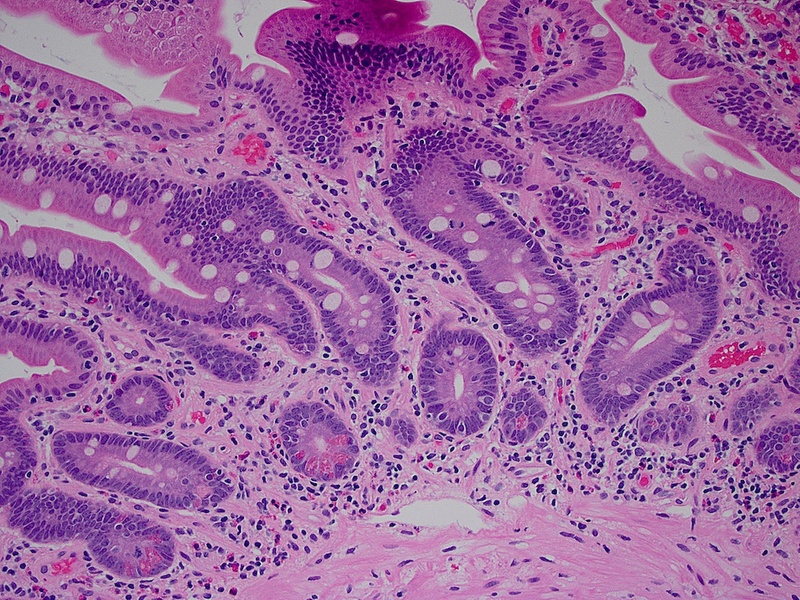 On endoscopy, CVID patients may have a nodular appearance to the mucosa due to lymphoid hyperplasia. In one case, the prominent nodularity led to a misdiagnosis of familial adenomatous polyposis (Indian J Pathol Microbiol 2009;52:530). 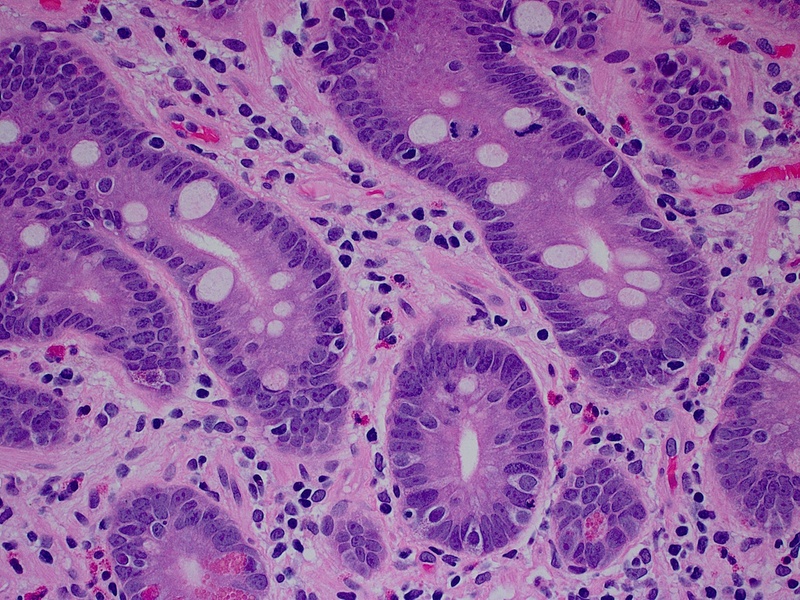 Common histologic features include small intestinal lymphoid aggregates (~50%), intra-epithelial lymphocytosis, villous blunting and a lack of plasma cells (Am J Surg Pathol 2007;31:1800). Increased apoptosis was seen in 20% of patients. These histologic features overlap with other conditions such as graft vs. host disease (prominent apoptosis) and celiac disease (villous blunting, intraepithelial lymphocytes); correlation with clinical history is helpful. Of note: GI biopsies in CVID patients should be scrutinized for infections, especially Giardia. CVID is associated with an increased risk of GI tract malignancies, including adenocarcinoma and lymphoma. There is a marked (47x) increase in gastric carcinoma, which may be due to the increased rate of H. pylori infections in CVID patients, although other mechanisms may also contribute (Am J Surg Pathol 2007;31:1800). The treatment for CVID is typically IVIG (J Allergy Clin Immunol Pract 2016;4:38). The prognosis depends on whether there is severe end organ damage from infections, and whether any serious associated autoimmune conditions or malignancies develop (Am J Surg Pathol 2007;31:1800).